This month I will be reinstating the ARTIST OF THE MONTH section. Many of you have said that you like more in depth focus on individual artists. For this newsletter I have chosen Nancy Callan to write about. 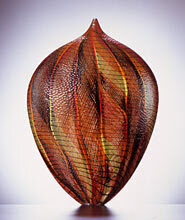 Nancy Callan is a relatively new artist to Holsten Galleries. I have known Nancy for at least ten years, as she is an integral part of Lino’s team when he blows glass in Seattle. In the five years that I have represented Nancy, I have watched her work evolve into what I consider to be some of the best and freshest glass sculpture being made by her generation of glass artists. I have always been impressed with Nancy’s technical skill as well as with her vivacious personality. 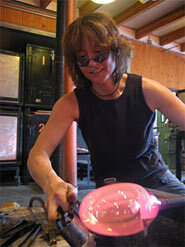 She is one of those people whose energy and enthusiasm for glassblowing is highly contagious. Influenced by childhood toys and comic books, Nancy’s work is always playful and, at the same time, always technically excellent. She handles difficult techniques with fluidity and seeming ease. Behind that fluidity is her experience of many years in the hotshop. Nancy received her B.F.A. from Massachusetts College of Art in 1996, where she studied with Dan Dailey and Robin Grebe. The main two series that Nancy is currently creating are the "Top" series and the "Cloud" series. She say about her own work: "While creating each piece, I try to balance the challenges of hot glass with the sense of wonder and fun I felt the first time I gathered (hot glass) from the furnace." Please click on any of Nancy’s images here to visit her web page and see more of her work. To watch Nancy making a piece at the Tacoma Museum of Glass, click here! "I am delighted to be the featured Artist of the Month with Holsten Galleries. This is my first experience working with Kenn in his virtual gallery and I anticipate a successful continuation of the relationships Kenn builds with his artists and his collectors. 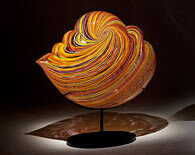 Being represented by Holsten Galleries means that my work is seen in the context of the best glass artists in the world. Kenn Holsten is extremely selective in his roster and I appreciate his definitive taste. Kenn is featuring two of my favorite series to date. The "Tops" have been signature pieces of mine for the past five years. The form is instantly recognizable as something both playful in origin and sophisticated in design. It is a great canvas for Venetian cane techniques and transparent color combinations; I love to play with movement in the cane and think about how it can bring the "Tops" to life. In my newer series the "Clouds" or "Clam-Clouds", I am inspired by nature and the way patterns form in wind, water, and sand. As in the "Top" series, I am using the form to showcase the color and lines of the cane. The "Clouds" have a lot of movement with the twisting and untwisting of cane around the sculpture, and I like this dynamic aspect. Some pieces from Morris’s "Idolo" series which have only been shown previously in a touring museum exhbition have just become available. The image here is of three of the small scale works from that series. There are also some large scale works available from this series. Please contact me for images of other available works as these pieces are not on my website. I will be presenting a one-person exhibition of the works of maestro Lino Tagliapietra at the second annual SOFA WEST in Santa Fe. I am particularly happy about this event as Santa Fe is the magical city where my wife Christine and I now live full time. The event is July 7-11 and we hope many of you are able to be here to say hello to Lino! We have chosen one or two pieces from each of Lino’s most important series and this promises to be a gem of a show. An online catalog will be available in late May.